"In the 1980s, it was our municipalities that led the way by passing the first smoking bans. The cities had the courage to go where state legislatures and Congress feared to tread. Now other cities are sure to follow, and eventually, legislatures will pass statewide bans of flavored tobacco and e-cigarettes, much like what happened with our smoking bans. It began with the cities." "Patrick Reynolds, the executive director of Foundation for Smokefree America, said that R.J. Reynolds, the tobacco company that his grandfather started, had spent a lot of money fighting the ban because it's concerned that if it passes in San Francisco, other cities will follow suit. The company didn't respond to messages from CNN. "Big tobacco sees vaping as their future," Reynolds, an anti-tobacco advocate said. "They are very afraid this is going to pass and if the voters make an informed decision to side with the health community, it will lead to hopefully a tidal wave of cities doing what SF did because the FDA did nothing. We will start to turn the tide against vaping." "Tobacco has a long history of spending to influence legislators," said Patrick Reynolds, the grandson of tobacco giant founder R.J. Reynolds. Now a fierce opponent of tobacco, Reynolds said, "They spend a lot because they get what they pay for." Patrick Reynolds, who lives in California, wrote in 1989 "The Gilded Leaf: Triumph, Tragedy and Tobacco," one part personal insight into the Reynolds family, and one part explanation for his anti-tobacco advocacy. When asked about the potential BAT ownership, Patrick Reynolds said that "a big monster has been devoured by a bigger monster. BAT's takeover of Reynolds does not bode well for the Third World, where Big Tobacco has been peddling their addictive, deadly products for decades, and selling them to the young, poor and uneducated, perhaps the only opportunities for growth that they have left. This merger is scary. Isn't causing one billion deaths in this century enough? That's what Big Tobacco will do, if present trends continue, according to the World Health Organization in Geneva." Most California voters are unaware the current State tobacco tax is 37th lowest in the nation. California's tobacco tax is 87 cents, while the national average is $2 per pack. "Almost everyone we interviewed thought California's present tobacco tax was high. Our other State taxes are high, so people assume our tobacco tax is as well. In the current multi-million dollar advertising war between the No on 56 campaign, well-funded by Big Tobacco, and Yes on 56, funded by the health community, this important fact has gotten lost. Knowing how low our tobacco tax compares to other States would help voters make a more informed decision about Prop 56," said Patrick Reynolds, Executive Director of the Tobaccofree.org. Did a mystical coin bring good fortune to the Reynolds family? Greeneville Sun: "One of the nation's most effective and committed anti-smoking activists brought his message to the Tri-Cities region this week..."
Patrick Reynolds:"Rather than banning the sale of tobacco, we need to continue the policies which have cut the rate of tobacco use in half over the past 50 years: cigarette tax increases, smoking bans and State spending on tobacco prevention and cessation. "Banning the sale of tobacco at the national level has never been a goal of the health community. However. I will defend the right of a small town to do it. A core principal of our nation's Constitution is that States and cities should be self-determining, and have the right to govern themselves." Patrick Reynolds: "It's ironic they're not allowed to smoke the cigarettes they sell. Reynolds American is cloaking themselves in the garb of responsible corporate citizens, but in fact, the company has continued to market to kids and fight policies proven to reduce tobacco use. They've spent millions in paid TV spots and political contributions to stop State tobacco tax increases and kill 100% Statewide smoking bans. For decades they denied second hand smoke is a health hazard, but now they seem to be admitting it is...."
Patrick Reynolds: "CVS has shown great leadership and made a real commitment to their mission of health. I believe they'll gain more customers than they lose. People will notice all the quit smoking products behind cashiers, where tobacco products used to be in CVS stores, and most customers will probably like that. CVS employees can be very proud of their company." Big Tobacco Dons a New Look: Are You Buying? Big Tobacco wants to reclaim the hearts and wallets of most adult Americans by rebranding its tarred image — pitching "smokeless" e-cigarettes, embracing the mantra "harm reduction," and funding science that could turn tobacco plants into life-saving medicine. That tactical shift, not surprisingly, has cultivated cynics like anti-tobacco crusader Patrick Reynolds, grandson of R.J. Reynolds, who calls the moves mere "window-dressing PR campaigns." "Their credibility is very low when it comes to trying to do good in the world," Patrick Reynolds said. "They're trying to adapt to the times. They see smoking as on the way out. They have a disappearing market base. They're looking to survive in the smoke-free world, and that is coming. The tobacco industry," he added, "they're trying to put on the emperor's clothes, but in the end, we see the naked truth." Patrick Reynolds: "Many people feel these lawsuits have no validity, and that smokers should be accountable for the death and disease they bring on themselves by smoking. They knew tobacco was dangerous, after all. But does this mean the tobacco companies should go completely unaccountable? In this case, the jury found the smoker was 30% responsible. Big Tobacco lied for decades about the dangers of smoking, targeted children in their ad campaigns, and failed to warn of the addictiveness of nicotine. That's why these suits are valid." Patrick Reynolds: "Today's merger of RJ Reynolds and Lorillard means that the tobacco industry is getting smaller. I'm happy to be a part of their decline, but there's still plenty to do." Patrick Reynolds: "This will help position CVS as pro-health, which is what a pharmacy should be. They have real vision, and this may well drive more shoppers to CVS." A new study published in the Journal of the American Medical Association attributes a drop of over 50% in the US smoking rate to tobacco control policies. Patrick Reynolds: "These policies include higher tobacco taxes, smoking bans and State spending on tobacco prevention and cessation campaigns." The study notes that 8 million people in the US lived an average 19.6 years longer. In response to the news anchor's question why smoking has increased around the world, he replies, "When Big Tobacco first anticipated the decline of smoking in the US, they began aggressive campaigns advertising their deadly products in the Third World, to poor, less educated peoples." Use Page Up and Page Down to turn pages. Patrick Reynolds: "How much safer is the e-cigarette than smoking? It may be like jumping out the 5th floor instead of the 10th. The smoke comes from a mixture of propylene glycol and water put through an atomizer. It will take years for definitive health studies to come in on the dangers to users, and to those inhaling the second hand smoke from them. The FDA forbids manufacturers from claiming it can help people quit. They know some e-cigarette companies have a goal of getting customers addicted to their nicotine cartridges. "But many smokers find a substitute helpful when quitting, and will use it in spite of the dangers. If you use the e-cigarette, don't trade one addiction for another; use it only for the first few days of your quit, as one element of a comprehensive cessation program. Within one week, after your initial withdrawal symptoms subside, destroy it. Do not go on vaping, it may be dangerous! Also see our free Quitting Tips at Tobaccofree.org." Patrick Reynolds: "A majority of new smokers, 60%, try their first cigarette by 14, and 90% of smokers get addicted before reaching age 19. Almost no one starts over age 20. The argument that by age 18 we offer the right to vote, get a drivers license or join the military falls flat when we recall how addictive smoking is. Most States don't sell alcohol to anyone over 21... This law is a very good idea, and shows common sense and vision." Are Federal Taxes Driving Smokers to Stop Lighting Up? In 2009, Virginia and North Carolina, the nation's top two growers of tobacco, passed bans on smoking at bars and restaurants.... "It pleases me greatly to see this avalanche of laws and ballot measures, especially in the South," Patrick Reynolds said. "For a tobacco-producing state to acknowledge that even secondhand smoking can be lethal is a wonderful victory." Patrick Reynolds, executive director of Foundation for a Smokefree America, said reductions in the rate of smokers are the result of strong limits placed on smoking in the workplace and other public areas, taxes on tobacco products that increase their cost, and the availability of cessation and education programs. ..."These large graphic warnings do three things," Patrick Reynolds said. "They inform consumers about the risk, they motivate smokers to stop, and they discourage kids and former smokers from starting the habit." Some 43 countries already require graphic warnings on cigarette packages, he pointed out. "It's time the United States did, too." Reynolds: "If you've tried to quit smoking before and failed, take comfort in the fact that most smokers fail several times before they stop successfully. Don't get the idea I can't quit. Understand it's part of the normal journey to becoming a non-smoker. Second,	get help. Get in a good program like the NCI's 1-800-QUITNOW or..."
Should smoking be banned from public parks? "Just because someone has already failed once, twice or more doesn't mean they can't be successful the next time. We know that now," says Patrick Reynolds, who in 1989 started the non-profit Foundation for a Smokefree America. "Failed attempts are part of the normal journey toward becoming a non-smoker." Reynolds is the grandson of cigarette company founder R.J Reynolds and a former smoker who's spent more than two decades taking the tobacco companies to task, amassing information about the ill effects of smoking, connecting with the best scientific experts, speaking to audiences worldwide — especially school kids — and sharing much of his accumulated knowledge on his website, TobaccoFree.org. "The FDA's graphic new cigarette warning labels are a major landmark in the fight against tobacco in the US. The labels are required on 50% of the front and back of all cigarette packs starting in September, 2012. The United States joins 43 other countries that already require similar labels..."
Tobacco giants are marketing heavily to a new generation of customers in developing nations. "As they have in the past, they're using tobacco farmers as pawns in a bid to deflect attention away from the health issue," says Patrick Reynolds of Tobaccofree.org. Mr. Reynolds debates the chief executive of the International Tobacco Growers' Association. Their impassioned discussion sheds light on international tobacco issues, cigarette company tactics and the main points of the UN's global treaty on tobacco. Before a packed auditorium Reynolds spoke of the loss of his father and brother to tobacco-related illnesses, which led him on a worldwide mission to fight the empire his family built... Smoking is a relevant topic when talking about heart health. For instance, Saint Francis Hospital, known for its cardiac care, sees more than 36,000 patients per year in its emergency department, said Margo Schafer, hospital director of public relations. Patrick Reynolds: “People relapse as a result of stress...The stress can be positive, such as being out with friends and being overwhelmed by an urge to smoke; or negative, as with the stress induced by work and pressure..."
The junior high auditorium is filled to capacity, yet the crowd is hushed. Students sit at rapt attention, uncharacteristically still. Tears glisten on their youthful cheeks, and even the tough guys listen quietly. On the stage, a few minutes earlier, Patrick Reynolds opened his talk with a promise, “Today, we’re going to get in touch with our feelings...."
CNN Wire: Patrick Reynolds, whose grandfather founded the R.J. Reynolds Tobacco Co., said the passage of the bill "marks the diminished clout of the tobacco lobby on the Hill." See Reynolds' press statement. 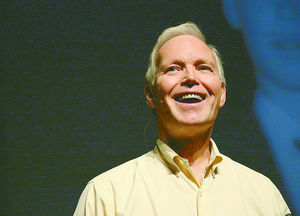 KATHAMERINI wire service: The speech by Patrick Reynolds caused a sensation at the conference. He has been involved in an anti-smoking campaign in the US for decades. Da Nea (The News): ...Besides what he has done in the US, Patrick Reynolds is now starting an international campaign. He hopes his visit to Greece will open doors to go to China, Russia, Turkey, the Middle East, and other countries where smoking rates are high. “If you call a friend a fool for smoking, you lose them. They tune out. On the other hand, if you approach them in a warm, friendly manner and tell what you’re feeling, your friend or loved one will open and really hear what what you have to say. The Bloomberg and Gates Foundations jointly give $500 million to fight smoking in poorer nations. Guest Patrick Reynolds applauds the focus on nations where smoking rates are highest, and talks about his plans to tour in China, India, Russia, and the Middle East. ...He later produced an evocative television ad in which Patrick Reynolds, a grandson of the tobacco magnate R. J. Reynolds, named the members of his family who had died of cancer, emphysema and heart disease. "To date, 24 states have already passed laws banning smoking from all bars and restaurants statewide, and 22 of them did so in the last six years," said Patrick Reynolds, president of The Foundation for a Smokefree America, a nonprofit group founded in 1989. "We are at the tipping point now." "If I could give you one message today, it would be that cigarettes are addicting. Once you start, it's almost impossible to stop," said Reynolds. "The best thing we can possibly do is try to prevent kids from starting," said Samaritan Hospital CEO Danny Boggs at a meet and greet after Reynolds' presentation. During his speech, Reynolds gave students what he called "an initiation into adulthood." He told them life is difficult... But Reynolds urged students to deal with the pain, not avoid it. "Don't run off to drugs or alcohol or cigarettes..." said Reynolds. He said to stay with the pain and talk to someone about it, because those who are isolated carry the weight of their pain. "Together, we will solve all the problems life throws at us," Reynolds said. When asked, many students said their parents smoke. Reynolds invited two students to the front of the auditorium to role play a conversation. Feelings accounted for the bulk of Reynolds' talk. He asked students how they feel, knowing tobacco companies target kids, to which one boy yelled, "I don't like it!" He showed pictures of what tobacco ads would look like if they told the truth. One showed Joe Camel reinvented as Joe Chemo, laying in a hospital bed. CNBC's Erin Burnett hosts Patrick Reynolds, The Foundation for Smoke Free America, Executive Director and Jacob Sullum, Reason Magazine Senior Editor. A marketing campaign, "Smoking With Aloha", seeks to correct misconceptions among Japanese that you can't smoke anywhere in Hawaii. Patrick Reynolds was one of the speakers urging the Beverly Hills City Council to ban smoking in outdoor dining areas. Reynolds told the Council, "Calabasis and six other California cities, and the entire state of Washington have done this. Every beach in Southern California has banned smoking except one, Redondo; this will protect the health of kids on crowded summer holidays. Twenty states have now banned smoking from all their restaurants and bars indoors -- eighteen of them in the past four years. We're at the tipping point now. Eliminating second hand smoke is a reasonable idea whose time has come." 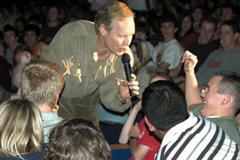 Patrick Reynolds supports the plight of Ontario's Youth gathered in Nation's Capital to fight the evils of tobacco. 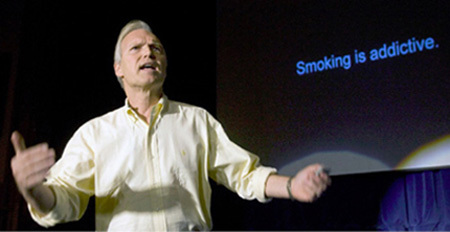 “There’s a clear link between the percentage of characters who smoke in films and the rate of youth smoking,” Patrick Reynolds... Reynolds said he applauded the idea of a mandatory R rating, but he said it was probably more practical to seek voluntary restraint from filmmakers, along with the screening of anti-smoking ads before movies and regulatory oversight to ensure that tobacco companies don’t pay production companies to put tobacco branding in their pictures. Proposals for smoking bans in cars with kids are cropping up around the country, with Patrick Reynolds, Foundation For A SmokeFree America Executive Director; Gary Nolan, The Smoker's Club Spokesman and CNBC's Sue Herera. Story ran in Washington Post, MSNBC, Fox News, Toronto Star, Scientific American, Reuters UK, Malaysia Star, Reuters India, KPLC TV LA, etc. Patrick Reynolds said, "At 18 cents, Mississippi's cigarette tax is 49th lowest among the states; it has not been raised for 21 years. Yet since 2002, 42 states have raised their tobacco tax. The average cigarette tax went from 43 cents in 2002 to 94 cents by the end of 2006 -- more than double in the past four years. Why? Higher tobacco taxes prevent kids from starting, give smokers strong incentive to quit, and provide states with additional revenues which help balance state budgets. They also pay for health care and tobacco prevention programs. Best of all for lawmakers, higher tobacco taxes are overwhelmingly popular with voters across party lines." At the end of his presentation to a community forum attended by 400, Reynolds asked who would stand up as a symbol of their pledge to call their representative on the City Council and deliver their feelings. Over 300 in the room got up. He told them, "Whether by State Legislature or ballot initiative, sixteen states have now passed laws providing for 100% smokefree bars and restaurants statewide -- 14 of them in the past 4 years, and six in 2006," said Reynolds. "We're at the tipping point. This is an idea whose time has come." National anti-tobacco advocates [argue] that outlawing [teen] smoking altogether could create a bigger problem. ...A better solution, Glantz and Reynolds said, would be counter-marketing tobacco companies, increasing cigarette taxes or imposing smoke-free laws limiting indoor smoking in all public areas. Studies have shown that smoke-free laws cut down on teen smoking as well as secondhand smoke, Glantz said. SOMERVILLE -- Many people try to persuade young people not to smoke, but few can be as riveting as the grandson of tobacco tycoon R.J. Reynolds. "The tobacco companies have targeted you," Reynolds told students, flashing pictures of Kool cigarette boxes with pictures of rap stars printed on them. "This is evil. This is totally going over to the dark side," he said. ...Reynolds started the Foundation for a Smokefree America and frequently delivers his message to groups across the country. He cited a recently released report by the Campaign for Tobacco-Free Kids that showed Illinois ranked 34th among states in spending on smoking prevention programs. Laws restricting smoking have been enacted in more than 2,000 municipalities across the country, Reynolds said, and 400 communities require 100 percent smoke-free workplaces. In addition, 14 states have laws requiring nearly 100 percent smoke-free protection. "I believe we're reaching a tipping point nationally with 100 percent [Statewide] smoking bans," Reynolds said. "But Illinois is behind. There is a need for Illinois to get up to speed on that." Are tobacco taxes hikes fair? ...While executives of the tobacco giant say the timing of all this is coincidental to Chicago's smoking ban, R.J. Reynolds’ anti-smoking grandson says he doubts that. "It really is an in-your-face effort to say 'Hey, here is a bar where we found a loophole where you can still smoke.' It is a rebellion on the part of R.J. Reynolds,” says Patrick Reynolds. MONTEVIDEO, Uruguay (AP) -- Patrick Reynolds, founder of the U.S.-based Foundation for a Smokefree America, praised Uruguay for joining other Latin American nations that have moved to curb smoking. "There is no safe level of secondhand smoke," Reynolds said. "It causes lung cancer and heart disease, and they're involuntary smokers." The grandson of the founder of the giant R J Reynolds Tobacco Company was in Ohio today, speaking out against smoking and cigarette companies. He long ago sold off his valuable RJR stock, and says he supports an issue that might appear on next November's ballot in Ohio that would ban smoking in public places. Reynolds: "A safer cigarette is like jumping out of the 15th floor, instead of the 20th floor..."
Should smoking be banned in some outdoor areas? Reynolds: "It's about time you didn't have to walk out of a building through a cloud of second hand smoke that's got poison in it. This is an idea whose time has come." Can Inheritors Save the World? Host: "Do you think that eradicating smoking is so important that you will invite an employer into an employee's private life?" Patrick Reynolds: "Employers have to pay more for smoker's health insurance. A lot of companies today — CNN is one (smiles) — won't hire new employees who smoke. This happens in States without laws protecting smokers. Just as the tobacco companies were held accountable for lying for years about the dangers of smoking and targeting children in their ads, smokers, too, should be accountable — and I believe you would agree with that." Host: "Fair enough, but..."
Reynolds gave a speech Tuesday night at Reid Hospital and another early Wednesday morning, before coming to Test Middle School and Dennis Middle School. Reynolds also spoke at Reid's monthly Women on Wednesday's program. At the schools, he closed the hour-long lecture with a story about a teenager who died at age 19 because of cancer related to smokeless tobacco. Pictures showed the boy as a healthy high school track star at age 17. Two years later, after surgery to remove cancer from most of his tongue and part of his neck, he died. Wilson said the imagery was shocking. Smoke Free America is a nonprofit group that encourages tobacco-free youth and tobacco prevention. Its Web site is www.anti-smoking.org. ...Then he had one WWS student bring a friend out of the audience, someone she said she would like to see stop smoking. He showed the students how to begin with a compliment, so as to open the lines of communication, and use feeling words such as "sad" and "afraid." 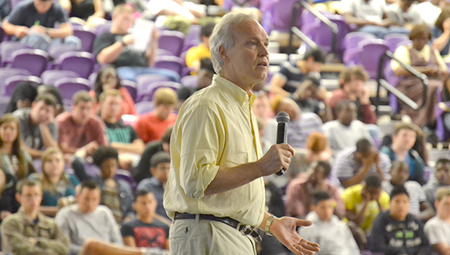 Reynolds ended his presentation with a story that made many of the students gasp. He told the story of an Oklahoma high school track star named Sean Marsee, who began using chewing tobacco at age 12, and tried to quit but continually failed. The whole time Reynolds told Sean's story — how he developed tongue cancer and had to have his tongue amputated; how his cancer came back and he had to have part of his jaw and nose removed; and how he had to have a hole cut in his neck and a breathing tube inserted — he showed a school portrait of the handsome, young athlete. "I'm grossed out right now, cause I play sports," WWS freshman Kyle Cassin said at the conclusion of the program. "It just freaks me out. It's like, 'No way.'" WWS freshman Jay Dragon said he would never smoke, adding his mom used to smoke, but she quit. ...The grandson of R.J. Reynolds will appear at numerous DuPage County high schools this week in an effort to discourage teens from smoking. On Wednesday night, as part of National Kick Butts Day, he’ll head a panel of speakers during a dinner at the Lisle Hilton. Events sponsors include the DuPage County Health Department and Central DuPage Hospital. Reynolds father, R.J. Jr., died in 1964... He later watched other family members, including his brother R.J. Reynolds III, succumb to cigarette-related illnesses. Those losses led to his desire to speak out against tobacco use, starting with testimony before Congress in 1986 supporting banning cigarette advertisements. Patrick Reynolds of TobaccoFree.org points out, "The rights of nonsmokers who may be standing nearby supersede the rights of smokers." Reynolds is the grandson of tobacco man R.J. Reynolds, and he became an anti-smoking advocate after watching his father die of emphysema. Leading anti-smoking activist Patrick Reynolds, a grandson of tobacco company founder R.J. Reynolds, said the bans are the result of "an idea whose time has come" – no matter what the industry says. "The tobacco companies always try to portray us as fanatics or zealots," he said. "But the truth is these are reasonable laws, intended in this case to prevent litter and protect non-smokers." TV Anchor: "Some people say tobacco companies are deliberately targeting teens with so called tasty cigarettes. Camel cigarettes has new flavors like Kauai Kolada and Twista Lime. Some anti-smoking groups say the candy-flavored smokes target kids. The Kool brand also has a line of flavored cigarettes. Tobaccofree advocate Patrick Reynolds had some thoughts. Patrick Reynolds: "Sixty percent of US smokers start smoking by age 14, and eighty to ninety percent become addicted before reaching age 19. If the tobacco industry doesn't get them as customers by age 19, it's unlikely they will get them as customers. Once addicted, a teen can be expected to spend $1200 per year or more on cigarettes, and will remain a customer for an average 17 years." Patrick Reynolds: "Brown and Williamson's ad campaign for KOOL puts rappers, hip hop artists, DJ's and dancers on the cover of the KOOL pack and in print ads. Attorneys General in several States have issued cease and desist orders for targeting youth. The tobacco industry knows that most smokers get hooked by 19, and Whatever brand a teen first gets hooked on tends to be the brand they stay with. We need to reinterpret the 1st Amendment, and join the nations who have ratified the World Health Organization's Framework Convention on Tobacco Control, which will further limit tobacco advertising. It's time to start listening less to the song of money, and more to the song of community and life." ...Reynolds also believes diminished expectations and heightened anxiety among today’s teens, documented in new research, is a significant factor [in teen smoking]. "Since the (Sept. 11, 2001) attack and the invasions of Iraq and Afghanistan, many of our youth are more worried about the years ahead," said Reynolds. "It is documented that following 9-11, there was a significant upsurge in smoking among New York teens. "Believing they face a bleak future, many teens may be prone to engage in high risk behaviors before an uncertain tomorrow arrives," he added. 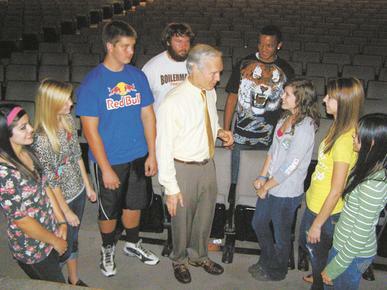 Tobacco heir talks shop with NicotineNarcs, other students. ...Students like Craft and Shekowski were both moved Wednesday by Reynolds' story of Sean Marsee, a 17-year-old athlete from Oklahoma who was diagnosed with tongue cancer as a result of "dipping" tobacco. Two years after Marsee's diagnosis and after numerous surgeries to remove parts of his cancer-ridden mouth, cheek and face, Marsee died. "He joined other opponents at the Colorado Capitol on Thursday to oppose the move. He said the upfront settlement - which Owens wants to use to bail the state out of its current and future fiscal problems - would prove costly in the long run. "It would dry up dollars used for tobacco-prevention programs that have proven remarkably effective, Reynolds said...."
"The grandson of tobacco magnate R.J. Reynolds said Colorado shouldn't sell off its share of the national tobacco settlement for a lump sum as Gov. Bill Owens proposes...."
"Thursday, anti-smoking and health advocates including the grandson of the founder of the R.J. Reynolds Tobacco Co. appealed to legislators to scrap Gov. 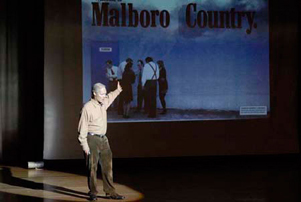 Owens' plan for a lump-sum payoff... 'These (smoking-cessation) programs have had spectacular results,' said Patrick Reynolds, who chose to work full time against smoking after watching his father die of lung disease..."
"Reynolds, attached to a long microphone cord, weaved among the hundreds of students on the bleachers and floors like a talk show host. He asked them their feelings about smoking. He put them in role-playing situations involving parental smoking. There were warnings about the tobacco industry's efforts to reach younger customers..."
"Reynolds' decades-long crusade against smoking has taken him to legislatures from California to Washington, D.C., and today will land him in the David L. Lawrence Convention Center, Downtown. 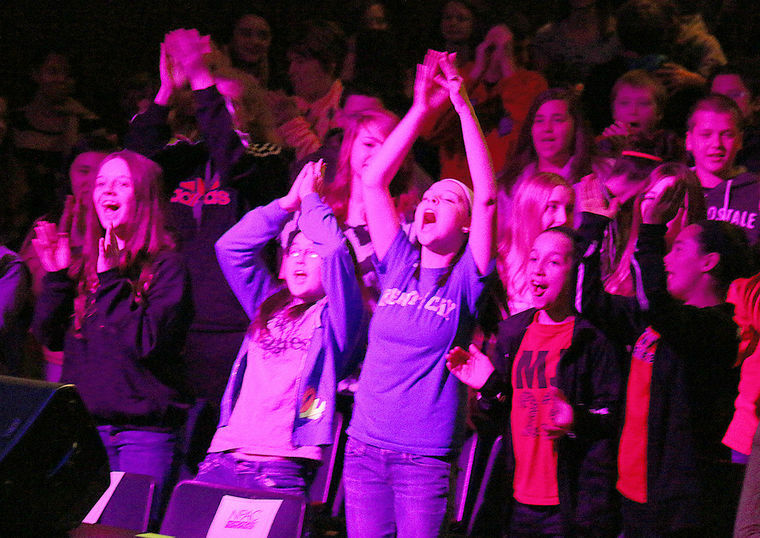 Organizers of the Pittsburgh Family Health Council's Peer Power convention -- at which Reynolds is the keynote speaker -- said they expect about 600 middle school and high school students to attend...."
in the Wisconsin Rapids (WI) Daily Tribune. 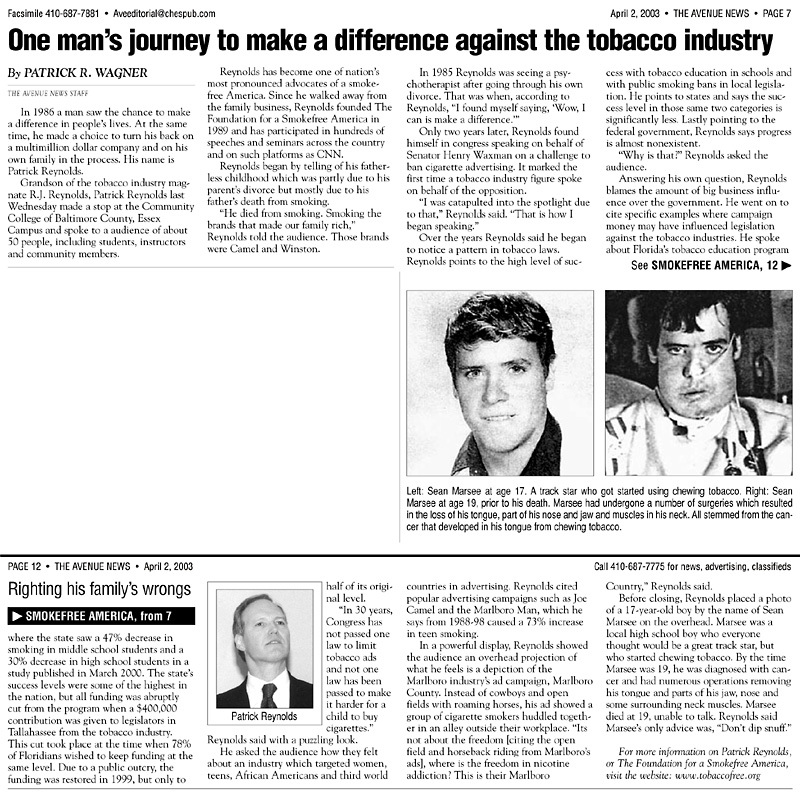 "Patrick Reynolds, whose famous last name has been tied to tobacco products for about 130 years, told about 830 area seventh-graders Thursday that tobacco kills....Sponsoring Reynolds' talk was the Tobacco Free Coalition of Wood County, St. Joseph's Hospital, Ministry Health Care, and the Riverview Hospital Association...."
"Patrick Reynolds, head of the California-based Foundation for a Smokefree America, said, ' There's an overwhelming body of scientific and medical evidence that proves second-hand smoke causes lung cancer and heart disease in nonsmokers. Banning smoking 100 percent is an idea whose time has come.'" provide optimal intervention for their smoking patients? The State now has the country's strictest limits on indoor smoking. "The Foundation for a Smoke-Free America has hailed the recent state bans. 'There is no safe level of secondhand smoke,' said Patrick Reynolds... I think it's a good indicator of the national mood on banning smoking.' "
"Whether the products are one percent safer or 15 percent safer, we really don't have any clue," Reynolds said. "The big danger is that many smokers may believe these products are safer than they really are, and will justify their continued smoking based on that." Reynolds: "In California, in 1994, we passed a 100 percent ban of smoking in all bars and restaurants, statewide...."
Should these lawsuits be allowed? the industry his ancestors helped create. He supports a proposed ban on smoking in L.A. restaurants. "Posterity may find that this ban was well ahead of its time," says Patrick Reynolds, an antismoking activist and Beverly Hills resident who saw his father die of emphysema. He is the grandson of R.J. Reynolds, founder of the famed tobacco company.